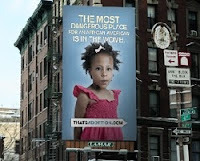 This billboard was placed in NYC's Soho area with the text: "The most dangerous place for an African American is in the womb." The sponsoring group states that Black women do not believe they have an option besides abortion. Do you feel this is true? Is it offensive? Is it misleading? Is it effective? What is your take on this type of free speech? The Birds & the Bees...and Treez!